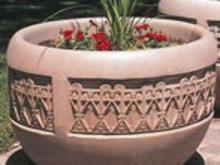 Planters are placed along the public way in SSA #51 to beautify the streetscape. The Special Service Area in Chatham is set up to improve the Aesthetic quality of the Public Way and to increase foot traffic along the business corridor. Additional services include Landscaping, Street Cleaning, Lamppost banners, Trash Receptacles, Planters and more. The SSA #51 Patrol provides landscaping along the pedestrian corridor. Decorative Banners, Holiday Decorations and Receptacles to improve the look of the business corridor.